This is an operation to “fuse” or stiffen the ankle joint. Arthroscopic means that the operation is done by keyhole surgery. Severe deformity of the rear part of the foot, such as a flat foot, high-arched or “cavus” foot, a club foot or other deformity, in which the ankle joint is also deformed, unstable or damaged. In these situations a fusion would be advised instead. We are sometimes asked if a fusion can be changed to an ankle replacement later. This is usually not possible, as the foot becomes too stiff for an ankle replacement to work. Two small (1cm) punctures are made at the front of the ankle joint.Â Through these the joint is inspected with an arthroscope. The surfaces of the joint are then removed with a motorised burr to reach healthy bone. 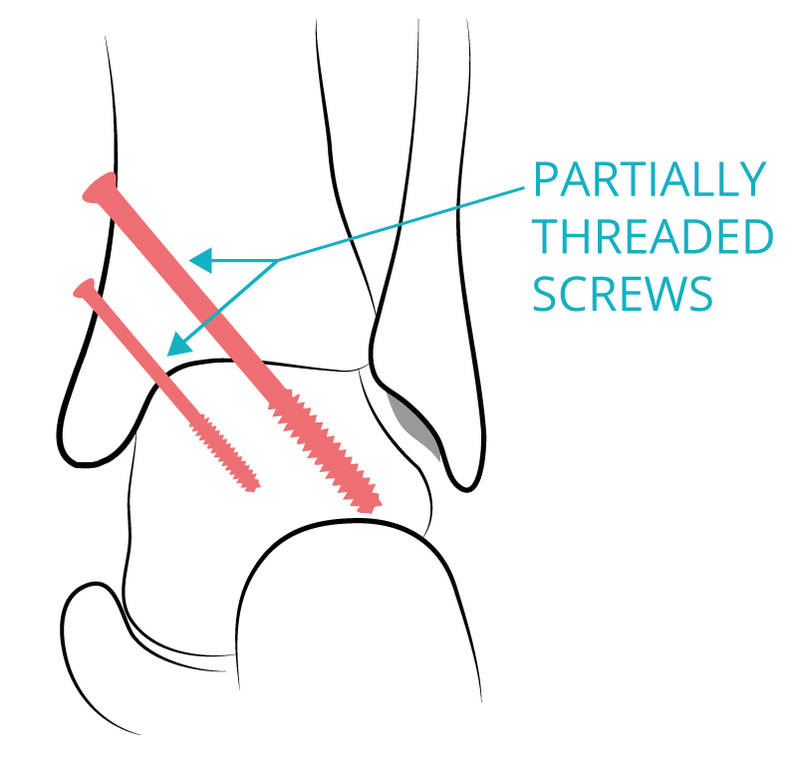 The joint is then put in the correct place and fixed with two or three long screws, through further punctures above the ankle, under X-ray control.Â The punctures are closed with steri-strips or a suture. A plaster back-slab (half plaster) is put on your leg at the end of the operation. The operation can be done under general anaesthetic (asleep). Alternatively, an injection in the back or leg can be done to make the foot numb while the patient remains awake. Your anaesthetist will advise you about the best choice of anaesthetic for you. Increasingly surgery is carried out with a regional block the leg is numb below the knee by injections adjacent to the nerves behind the knee.You can choose to have sedation so that you sleep lightly during the operation.The block can last 24-48 hrs giving good pain relief, but you will also be given pain-killing tablets as required. Most people who are reasonably fit can come into hospital on the day of surgery, having had a medical check-up 2-3 weeks beforehand. Some people will go home the same day as the surgery: others will stay for I or more nights. It depends on how well you will manage with crutches. You will need to wear a plaster from your knee to your toes 6 weeks followed by a boot for 6-10 weeks. For the first 6 weeks you should not put your full weight on your foot as it may disturb the healing joint. By the time you go home you will have mastered walking on crutches (or a walking frame). After surgery your foot will tend to swell up quite a lot. You will therefore have to rest with your foot raised to help the swelling to go down for the first 2 weeks. If you get up too quickly this may cause problems with the healing of your foot. Two weeks after your operation you will be seen again in the clinic. Your plaster will be removed and the punctures and swelling of your foot checked. If all is well you will be put back into a lightweight plaster. You should continue walking with your crutches, gradually increasing the weight you take through the operated foot. About 6 weeks after your operation you will come back to the clinic for an x-ray. If this shows the joint is healing in a good position you can start putting your full weight through the plaster/boot. You will have further x-rays after 12 weeks. When the x-rays show that the joint is fused enough, the boot will be removed and you can start walking without it. As explained above, you should not walk with full weight on the foot for at least 6 weeks after surgery. After your plaster is removed you can start taking increasing exercise. Start with walking or cycling, building up to more vigorous exercise as comfort and flexibility permit. Obviously, the foot will be stiffer after surgery and you may not be able to do all you could before. However, many people find that because the foot is more comfortable than before surgery they can do more than they could before the operation. Most people can walk a reasonable distance on the flat, slopes and stairs, drive and cycle. The foot is not completely stiff as the other joints of the foot will tend to compensate for the fused ankle, especially if those joints are not affected by arthritis. Walking on rough ground is more difficult after an ankle fusion because the foot is stiffer. It is rare to be able to play vigorous sports such as squash or football after an ankle fusion. The most serious thing that can go wrong is infection in the bones of the ankle. This only happens in about 1% of people, but if it does it is serious, as further surgery to drain and remove the infected bone and any infected screws or pins will be necessary. You may then need yet more surgery to get the ankle to fuse in a satisfactory position. The result is not usually as good after such a major problem as if the ankle had healed normally. About 5-10% of arthroscopic ankle fusions do not fuse and need a further operation to get the bones to fuse – basically another ankle fusion.Â One of the causes of this is smoking which somehow seems to affect the healing of bone. The risk of a non-union of an ankle fusion is 20 times greater in a smoker than a non-smoker. We would strongly advise a smoker to stop smoking prior to this type of surgery. Minor infections in the wounds are slightly more common and normally settle after a course of antibiotics. Research shows that 10% of ankle fusions do not heal in exactly the position intended, either because the position achieved at surgery was not exactly right or because the bones have shifted slightly in plaster. Usually this does not cause any problem, although the foot may not look “quite right”. Occasionally the position is a problem and further surgery is required to correct it. Sometimes the screws become loose as the bone heals and cause pain or rub on your shoe. If this happens they can be removed – usually a simple operation which it is often possible to do under local anaesthetic. We find that about 10% of our patients need the screws taken out.